I grew up in Lebanon, a tiny country in the Mediterranean, watching my grandmother painstakingly cook delicious meals from the bounty of the land. Being a girl, I was expected to learn how to cook, manage a house and mend clothes. Otherwise, my chances of landing a good suitor were slim to none. I did not really care for marriage. My priorities were to retain the village championship in marble-throwing, to be the fastest kid in stuffing my mouth with 20 berries all at once (never mind the stains on my clothes), and to outdo any boy in climbing the olive tree that masked the entrance to my grandmother’s house. I was the toughest girl among a pack of village boys. My grandmother and I wrestled with changing my priorities, and one of her tactics was challenging me to fill up a cooking pot with stuffed cabbage leaves faster than she did. It was, and continues to be, my favorite meal. The smell of garlic, the fresh lemon juice bathing each cabbage leaf, and the aroma of spices wafting through the rooms of the house were intoxicating. I would wolf down half the pot in nanoseconds. Cooking stuffed cabbage leaves is labor-intensive, but my grandmother always called it a labor of love. She used to tell me if you do anything with love, it always comes out perfect. I separated the leaves from the core, while keeping the leaves intact. After blanching the leaves in boiling water, I removed the cabbage ribs, and filled each leaf with a mixture of ground lamb, rice, and the seven spices (cardamom, cinnamon, cloves, nutmeg, pepper, paprika, and allspice)—a must in every Lebanese kitchen. I rolled the leaves and stacked them, with unpeeled garlic cloves between, in a cooking pot. I added enough water to cover the cabbage leaves, and cooked them over low heat for a couple of hours until the rice was done. Adding some lemon juice, dried mint, and more garlic sautéed with coconut oil produced a feast fit for a king. Needless to say, it took a few hours to produce, especially if you’re talking about 50 cabbage leaves to roll. Years later my grandmother passed away, and I buried my childhood memories in the coffin of adulthood. I became concerned with only matters of consequence. I got an education, climbed up the corporate ladder, traveled the world, surrounded myself with sophisticated people, and obsessed only over success and influence. I thought I had arrived at my goal, until one day my footsteps led me to the Coppell Community Gardens. I walked through a rainbow of colors, with the aroma of basil and oregano welcoming me at every corner, and the fruit orchard beckoning me to sample some of its gifts of pears and peaches. I felt I was home again, expecting to hear my grandmother asking me to join her under the shade of the olive tree for an afternoon Turkish coffee and a lecture on female etiquette. I am told childhood memories cannot be recaptured, but on that day I discovered that I could recreate them. My journey home started with 30 guardians of the Coppell Community Gardens. They taught me how to grow my own vegetables, to regard the land as an extension of myself, to respect the wisdom of the ever-changing seasons, and to love unconditionally as the land readily gives to all. I wanted to grow my own cabbages, and the search for the variety my grandmother grew became intense. That cabbage grew to an average of 12 pounds, the head was flattened at the top, and the leaves were sweet and did not split once the plant reached maturity. I checked with many seed companies and called on all the experts I knew. My quest even brought me to a seed expert, who consulted his giant book of seeds and declared that such a variety did not exist. I told him that when I was a child I helped my grandmother harvest and cook those big cabbages. He sympathetically responded, “when you are a child, everything looks big.” But to give up on the quest would mean my childhood memories never existed and my grandmother was just a dream. I was determined to find my cabbage seeds. My extended family in the old country conducted many queries with farmers, until our search led us to one variety that we could translate to English as “Early Drumhead,” grown only in the Mediterranean region. I readily ordered the seeds, and nurtured them with love and attentiveness until they grew into seedlings. Last fall, I gingerly laid them in the soil and blessed them as my grandmother always did when planting. She believed that every living thing had a guardian angel, and wanted to ensure the angel of cabbages did not wander off to another plant. My seedlings made themselves at home and grew into beautiful heads. I had numerous neighbors stopping by and admiring their perfect shape, and children standing in awe at the size of the cabbage heads. 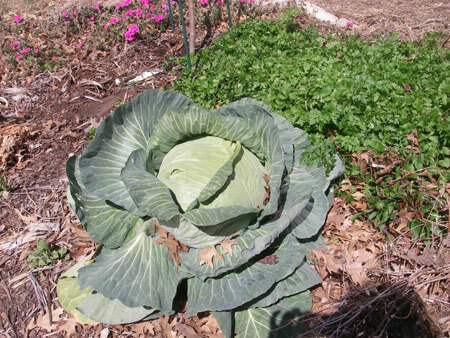 Finally, my cabbage heads matured, and the last one I harvested weighed 13 pounds. I have reliable eyewitness accounts and a picture of one of my cabbages. I cooked my first cabbage head just like my grandmother had taught me. I watched my own children wolf down a huge pot of stuffed cabbage leaves, just as I had done in another lifetime. I recreated my childhood memories through my children, knowing my grandmother is still with me. We had lovely flat cabbages like that in Jamaica. Not so big though. to be able to pass on age old recipes that many people can try. Remember the good things (food) of our lives with family members. I just loved the blessing of the cabbage seeds. My Mother blessed everything she did, afgans, Easter Bread and baking items, even sewing aprons. I must say I now do the same, I don’t tell this to everyone–they may look at me strange. I too make cabbage rolls in the Slovak tradition for my children and grandchildren. Thank you for the wonderful story……….. This story brought tears to my eyes. Just this morning as I was out for a jog with a friend, I was reminiscing with her over the foods and smells of our childhoods in our grandmothers’ kitchens. We were each longing for different things, but the longing was as much about the loving embrace of of our long-gone grandmothers, as it was the heritage food that no one else could ever get to taste quite the same way. I’m going to dig out my grandmother’s recipe file and try. Maybe my 3 little girls will get a taste of love from their Omie, whom they never got meet. Thanks for printing this story. As the grandchild of an Italian immigrant who grew up in her grandparent’s garden, your story brought back those memories with delight! Thank you for taking the time to write what was inside of you. I AM VERY GLAD HAVING THE IDEA ON THE ARTICLE “ARE PESTICIDES A CAUSE OF DIABETES” AS WELL AS GRAND MOTHER’S STORY. I AM A ORGANIC LOVER, INTERESTED IN ORGANIC FARMING.I HAVE A PLAN TO ESTABLISH ORGANIC FARMING IN BANGLADESH WITH A VIEW FOR HOME CONSUMPTION AS WELL AS EXPORT THE PRODUCTS, SINCE THE SOIL OF THE COUNTRY IS VERY FERTILE AND THE LABOR IS CHEAP. ANY ENTREPRENEUR IS WELCOME IN BANGLADESH FOR INVESTMENT. I WILL INVITE SUCH TYPE OF HEALTH AND ENVIRONMENT RELATED ARTICLES. Thank you for shareing your childhood memories, I really enjoy reading it . It brought back memories of my childhood when I was going up in a small town in Eastland, Tx. My grandmother had her roses garden and my mother had her vegetable garden . And today I grow my own vegetables and have lots of roses that I just love . Thank to both my mom and grandma for the memories of yester year. This was such a wonderful story to read – thank you for sharing it, both to Mary and to Maria.